Sounds complex ?… Don't panic ! If what is exposed in this article seems complicated and off-putting, do not panic ! 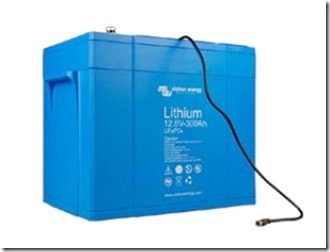 It would be a shame not to persevere on the path of lithium and its many benefits because these concepts and tips are actually pretty basic for a marine electrician. It takes a bit of care, the method and the choice to have a powerful facility that will forget. Do not hesitate to advise and support by a professional who has experience in the design and installation of systems of lithium battery. A few euros you spend will be a good investment. As in a lead-acid battery, the Lithium battery is made up of positive plates, negative plates and an electrolyte. A lithium battery plates are porous and fully absorb the electrolyte so although there is no liquid in the battery. But unlike the lead-acid battery where the load and discharge cause chemical reactions that transform its components, in a Lithium battery the charge and discharge are by a plate Lithium ions moving to another. When the battery charge, the Lithium ions migrate in the electrolyte to come fit in the negative electrode carbon structure so that the positive electrode (LiFePo4) impoverished in lithium to leave only the Crystal structure FePo4. 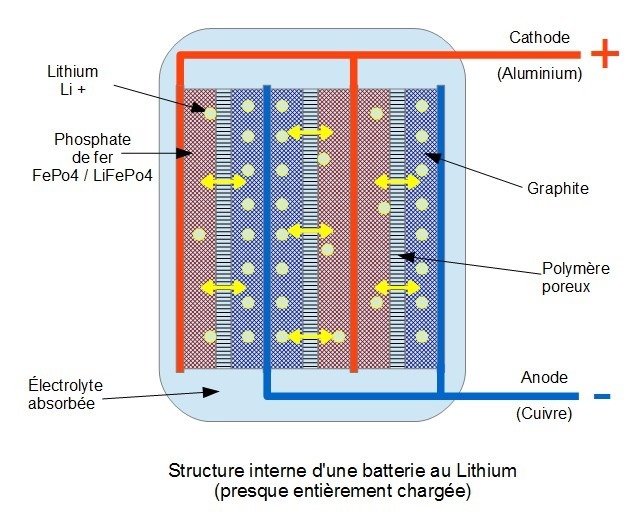 Vice versa, during the discharge, the lithium ions leave the negative electrode carbon structure, migrate into the electrolyte and return fit into the Crystal structure of the positive electrode to re-form LiFePo4. A lithium battery components are very stable and, in a perfect world, unaltered by this process of "insertion".… But other phenomena can occur and damage the battery more or less quickly. A layer "Interface." (SEI), between the electrolyte and the plates, is formed by chemical reaction when battery is made. This layer "SEI" contributes to the chemical stabilization of the battery… But over time this layer continues to grow until it becomes detrimental to the proper functioning of the battery. High temperature this layer does he think faster. It is therefore imperative to protect the high temperature lithium batteries. The ideal is to keep between 15 ° C and 25 ° c..
Load at low temperature : When the temperature is near or below 0 ° c., the absorption capacity of lithium in the anode is greatly reduced. Acceptable at 20 ° C charge current will damage the battery at low temperature. Support mode "Float". : Continue to charge a battery once it is 100% SOC will force the displacement of all the lithium ions to the carbon electrode, they can be inserted or not. Lithium that cannot be absorbed by the electrode will settle on this one in the form of metal. It is imperative to stop any charge once the battery reaches 100% SOC. It is the main cause of destruction of a lithium battery… more or less quickly depending on the frequency and levels of surge / Overload. A voltage of 13,6 plug (3,4 volts per cell) is sufficient to charge the battery at close of 100% SOC - the absorption phase is just a little long. A voltage at the top of 13,6 volts applied to an already charged battery will overcharge the battery and damage it even if the charge current is zero. The tension is high, This is more fast. In practice a charging voltage of 13,8 plug (3,45 volts per cell) allows to load quickly to around 100% SOC. But it is imperative to stop the load as soon as the charging current falls below 0, 033C (3,3 amps for a park of 100Ah). Any voltage above these levels will damage the battery and at the top of 17,2 plug (4,3 volts per cell) the electrolyte will decompose into gas that will increase pressure in the battery until it is deformed and eventually catches fire. If a LiFePo4 cell is discharged below 2,0 volts polarity will suddenly reverse itself and the copper anode will dissolve in the electrolyte. When charging the copper dissolves in the electrolyte rushes and is deposited on the surface of the cathode in the form of sharp crystals. Which may pierce the thin separator between the electrodes and create a short circuit. When several cells are connected in series and one of the cells is completely discharged before the others, the current will reverse in this cell… What will destroy it. If we charge it can catch fire. To throw a cell voltage has collapsed - never attempt to recharge. It is therefore imperative to measure voltages at the level of each cell. A measure of the voltage of battery Park is not enough ! The lithium batteries are very resilient and low risk. Even if we cut a cell by pressing a nail perpendicular to the plates, This will create a one-off short circuit, free heat and a lot of gas, but won't be enough to make it fire. On the other hand, a very violent shock or a crash on the outskirts of the plates could be short circuit on a larger surface plates, What could cause overheating and a thermal runaway. A lithium battery short-circuit current can easily exceed 20 to 30 c (either 8 000 to 12 000 Amps for a park of 400Ah). Although builders tests show that this is not enough to explode or ignite a battery in good condition, just imagine what this will do to the spanner on the pods ! It is difficult (but not impossible) to ignite a lithium battery. When this happens the temperatures are such that can melt metal and glass. The thermal runaway occurs when the internal temperature reaches 200 ° c. (other types of batteries the lithium - cobalt, nickel, manganese… – have higher energy densities and temperatures of lower thermal runaway). It's a chemical reaction with the release of oxygen from the cathode (LiFePo4) and a very strong heat development. Overcharging of the battery will damage the battery up to destroy it, but it is unlikely that this creates enough heat to trigger thermal runaway. Even without reaching the thermal runaway, a battery that has heated and/or shows outward signs of deterioration (Shell inflated or split) suffered severe internal damage to the plates and/or level of the electrolyte that was incinerated. It must in no case be recharged without running serious risks. While some facilities are in place for a dozen years, I have found no report indicating that a battery properly used in a marine application happened at end of life. There are a dozen years, the precursors had the manufacturers specifications to guide them in the use of lithium batteries. Over time, with the accumulation of experience and batteries damaged, These advanced users recommend to reduce the load voltage and increase the tension under which we should not go down. Here is a compilation of the values to which these users of long date (LiFePo4 as battery on a sailboat) seem to be converging to avoid stressing the lithium battery and maximize its life expectancy… whatever the manufacturer of LiFePo4 batteries. Note that these values are of the extremes never exceed. Any excess of the optimal values cited high risk of irreversible battery damage and reduce performance more. Attention to the specifications given by the manufacturers ! A serious manufacturer as Victron advocates, for its lithium batteries (LiFePo4), parameters widely above these optimal values (Load between 14V and 15V voltage / Float 13, 6V / Operating temperature between - 20 ° C to 50 ° C). In addition to a fuse, the heart of the protection system is BMS (Battery Management System). Its role is to protect the cable short-circuit. It must be placed as close as possible to the battery. 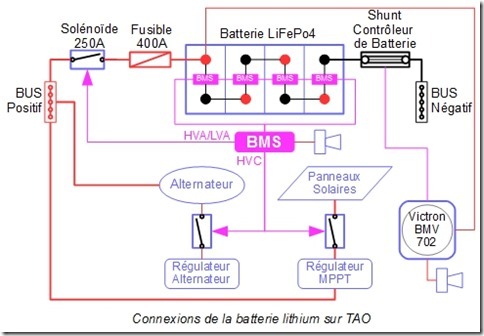 We have seen that a lithium battery short-circuit current can exceed the 8kA and simply that the resistance of the cables and connections is less than 1,7 milliohms to get such a running under 13,3 plug. 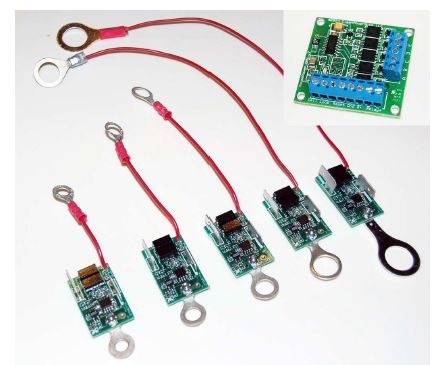 What is quite possible if the short circuit is close to the battery (a 50mm 2 cable has a resistance of 0,3 milliohms per meter) and connections are well made with a low resistance of contact on the order of a few tens of microohms. It is therefore important that the fuse breaking capacity is higher than 8kA. 250A ANL fuse – 6kA breaking capacity An ANL fuse has a capacity of 6kA order break and if the current is higher there is a risk of electrical arcing around the fuse and the circuit is not cut. 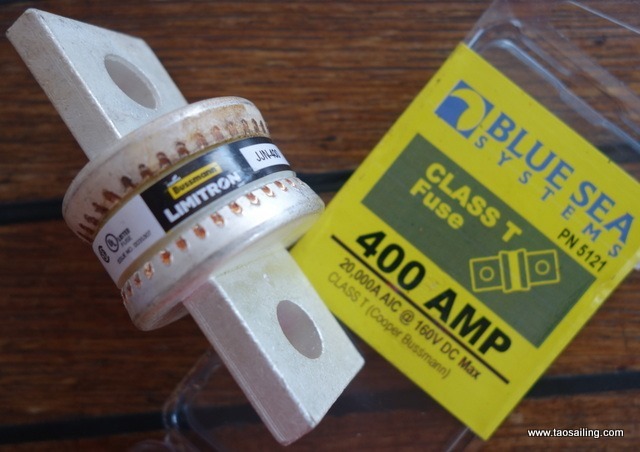 Fuse Class T 400 a. – 20kA breaking capacity A "Class T" fuse has a breaking capacity of 20 kA and seems to be a better choice. The fuse must be size so have some margin so many big consumer operation at the same time (windlass, Electric winch, desalinateur, converter…). For my application I installed a "Class T" 400A fuse. The BMS is an electronic unit that protects your battery against a power surge, undervoltage, too high a temperature and an imbalance between cells. The BMS is not the system which controls the battery charge in logging and cutting systems to load at different levels. 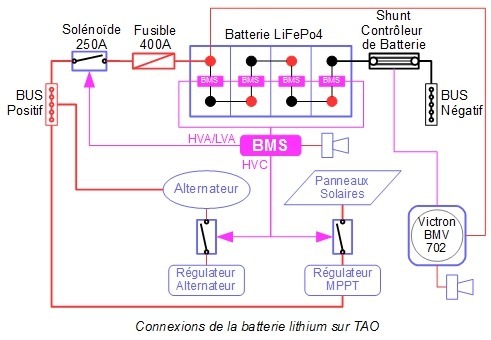 Support systems must be programmed to charge the battery in optimal conditions and the BMS intervenes only in case of failure of these systems. 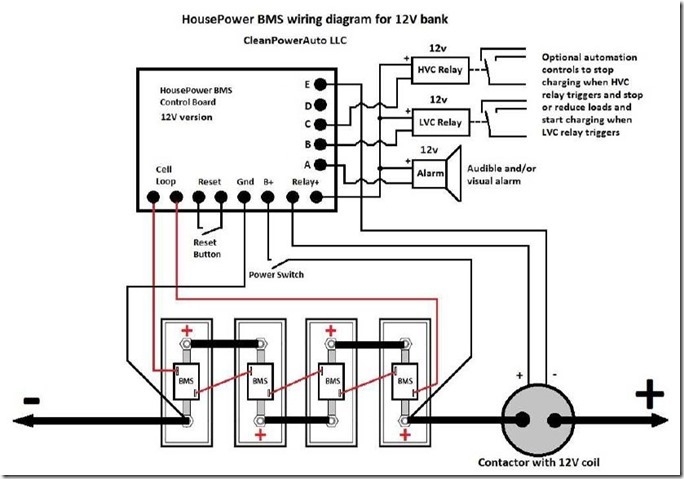 I installed a BMS manufactured by CleanPowerAuto LLC in the USA : HousePower BMS. But this company has been acquired by an integrator of lithium batteries and this BMS is no longer marketed independently. There is more support or ability to buy spare components. So I will soon find another BMS to replace. If you have experience with other BMS, I'm interested ! For the BMS HousePower, the voltage from which a cell's dominance is 3,55 volts and as the load of this cell is not completely stopped, the tension continues to climb… This feature isn't fully effective to protect the battery. With a maximum charge voltage 13,8 plug (3,45 volts per cell), the shunt voltage of 3,55 volts will not be reached unless the charge controller failure. 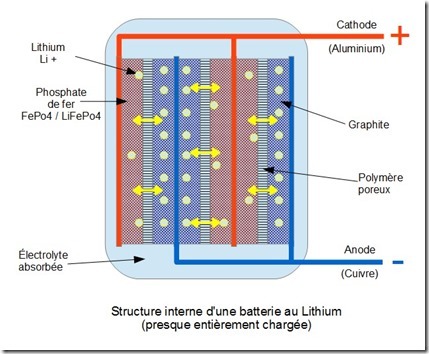 Balancing of the cells of a lithium battery will be covered in a future article. The BMS will drive relays correctly sized for cutting various load circuits (HVC), consumer (LVC) and also to isolate the battery as a last resort (HVA and LVA). The topology 'flat spaghetti' that is found on many sailboat is not always the most appropriate for effective installation of the BMS. An analysis of the existing and necessary with possibly a reconfiguration of the wiring. 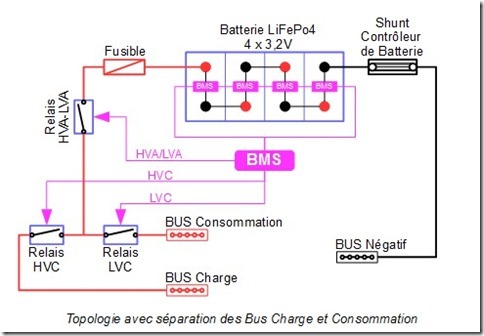 A good practice for electric installation on the sailboat is to have two 'Bus' positive. A 'Bus' of charge to which are connected all systems load and a 'Bus' of consumers for everything that consumes the power. In this way support systems can be disconnected without disturbing the rest of the system and vice versa. You will notice, very important thing, that only two wires are connected to the lithium battery (possibly the battery DC voltage probe). All connections are made on different buses. 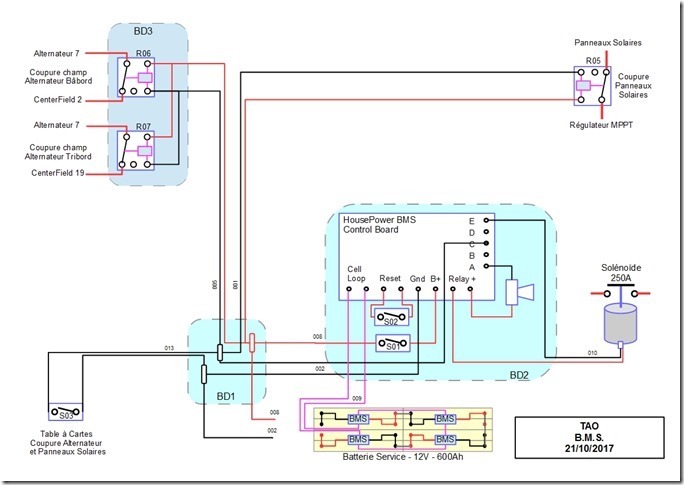 It is not always possible because if, Like me, you have a MultiPlus of Victron charger-inverter, with a single cable that connects to the battery, This strategy has the lead in Wing. But it is nevertheless desirable to approach. without special precautions, under penalty to destroy ! Other types of regulators (wind turbine, PWM solar…) are likely also to be destroyed and/or send excessive tensions if they are disconnected under load. It is therefore necessary to reflect on the impact of these actions on the producers of currents and their control systems. 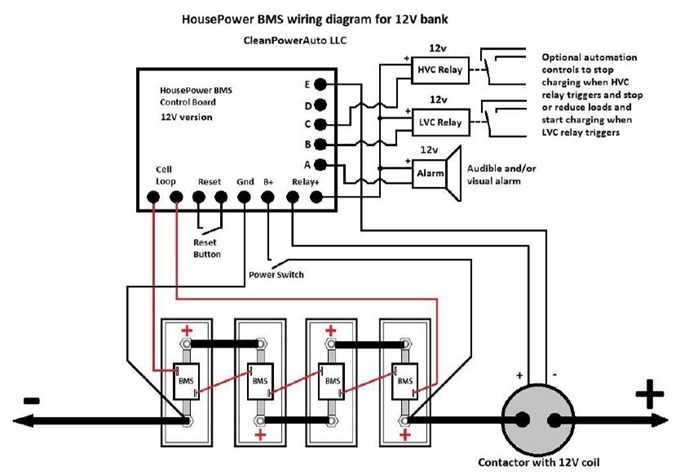 A first approach is to use the 'High voltage warning' output (HVC) the BMS to drive disconnection of each charging system based on its specificities and the recommendation of the manufacturer. "Advanced" support systems : More and more manufacturers provide an output to control the market / the charger station. Either with two sons, or through a data bus. 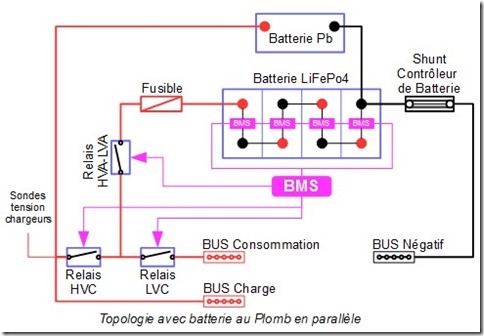 Another approach is to keep a lead battery in parallel with the lithium battery (connected to the load Bus). 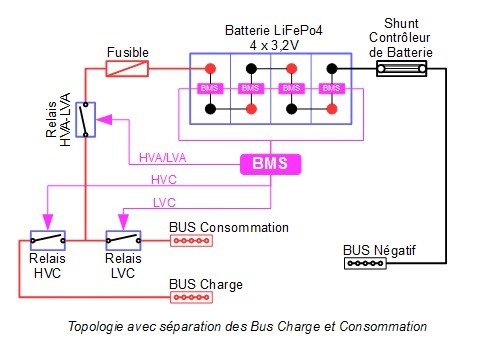 When the HVC relay opens to disconnect the load Bus lithium battery, support systems have a battery to charge and are not disturbed. It is important to have the voltage probe of the systems to load connected after the relay so that the load regulation to operate properly when the relay is open. I wish I could cut all systems load manually. I wish that the solar panels can be stopped by the BMS as we are not always on the boat when they load the battery. I hope that alternators will be arrested by the BMS for long navigations to the engine, vigilance is less. The dock feeder is used only rarely with the generator (connected to the electric network of a wharf) and always when we're on board. I decided to not fly by the BMS, but putting in place sound alerts from any derivative of tensions. The big energy consumers are the windlass, the electric winch and the converter 220V to power the desalinateur. I made the choice to not drive their disconnection by the BMS because we are always on board when they work and can cut them manually if an early sound alert occurs. Of more if the SOC is lower than 25% We put the generator running when we use a big consumer. All orders are at the table cards and easily accessible : power switch of the converter, start-up of the generator, Manual power generators and solar panels. If the voltage of a cell reaches an extreme value, I wish that the battery is isolated by disconnecting it from all circuits. 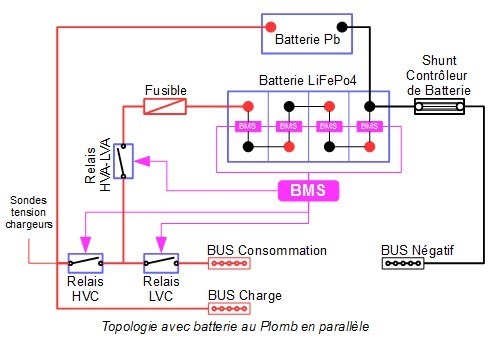 When the boat is left for a long time with no one on board, the lithium battery is charged to 50% and completely disconnected from any circuit (including the BMS which over a long period could empty it). A controller batteries (Victron BMV702) is installed with sound alarms of low and high voltage, paid way more conservative than HCV and the BMS LVC warning. This allows us to react manually before the BMS intervene. The sound alert is triggered if the battery voltage is slightly outside the above optimal values (less than 11, 8V or higher than 14, 1V). Nothing serious for the battery, but it's a sign that a component of our system does not work normally and we can fix it until it gets worse. Note I can order manually by a switch relay that cut generators and solar panels. This allows me to stop the charge once the batteries are full and restart them when the SOC is below 30%. If the voltage of a cell approaches a critical level (less than 2, 6V or greater than 3, 65V) the BMS control a solenoid that isolates the battery. This solenoid can also be controlled manually for maintenance operations. There is a risk if HVA occurs before HVC as generators and solar regulator would not be arrested before being disconnected from the battery. For that to happen should a cell be 3, 65V then the others are 3, 55V, either a balance of 0, 1V between cells. To limit this risk, every two months, I control the voltage of each cell in 100% SOC. In nine months the difference in maximum voltage between cells is 0, 007V. I'm not worried. Hello TAO and thank you for your unique experience lifepo4 in return . 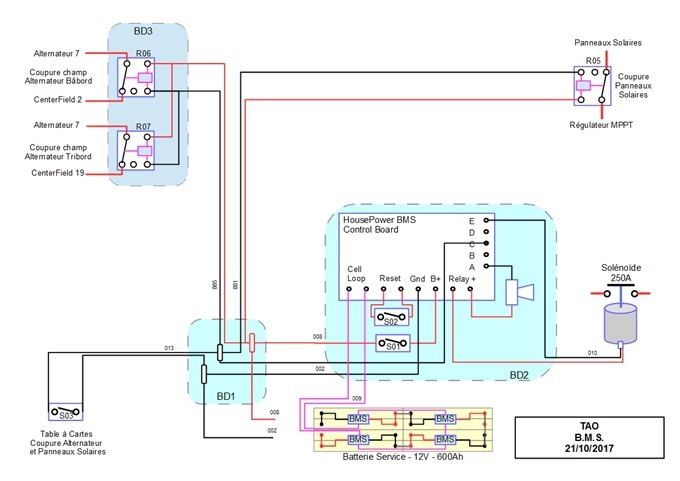 What think you of the bms 123 with sends ev-power Bluetooth ? This seems to avoid the famous dish of spaghetti and answer your expectations. Have you found an other BMS which satisfies you today ? I chose the batteries but galley at the level of the BMS. Bravo for your tuto Philippe! good, I'll still read a good 1/2 dozen times, but already at the 1st reading, I understand the principle….